This lesson, another extensive one, is on fiber optic testing. 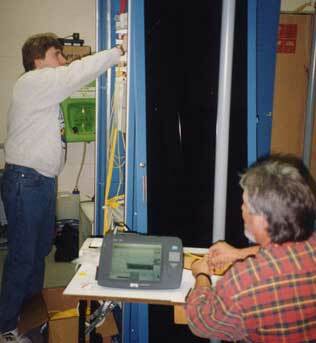 Testing is the most complex part of fiber optics but one of the most important. After all fiber optic cables are installed, spliced and terminated, they must be tested. For every fiber optic cable plant, you need to test for continuity and polarity, end-to-end insertion loss and then troubleshoot any problems on every fiber in every cable. If it’s a long outside plant cable with intermediate splices, you will probably want to verify the individual splices with an OTDR test also, since that’s the only way to ensure that each splice is good. If you are the network user, you may also be interested in testing transmitter and receiver power, as power is the measurement that tells you whether the system is operating properly. Testing involves visual inspection of terminations with a microscope, tracing fibers visually and finding faults, measuring optical power and loss with power meters and light sources and sometimes specialized testing with OTDRs and testers for special issues in long distance links. With this lesson, it's important to learn what needs testing and why, what are the potential errors involved in the tests and where certain tests are appropriate. For example, all installed cable plants require insertion loss testing but some may also need OTDR tests, but OTDR tests are generally not appropriate for short cables and always require a knowledgeable operator to interpret traces - they are not "push button" testers! Testing gives you data - in this case the loss of the fiber in a cable plant. But does that test data tell you the cable plant loss is good (low enough) or bad (loss is too high)? You need to know that to pass or fail any fiber being tested. The way you estimate the loss of the cable plant is to calculate a "loss budget" for the fibers in a cable plant. Generally the loss budget is done during the design phase of a project and the data used to validate the design for use with communications equipment. But that same data should be used by the installer/tester to compare to test results and make the pass/fail judgement. Installed Cable Plant Testing (OFSTP-14) Virtual Hands-On: Insertion loss testing, What Loss Should You Expect?